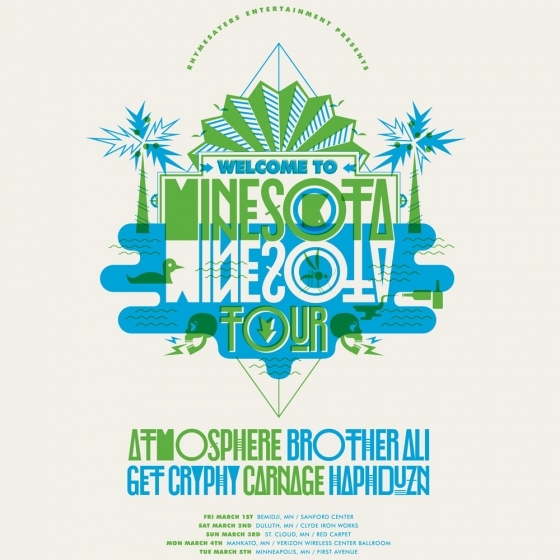 This March, Rhymesayers and Atmosphere bring you the Third Annual “Welcome To Minnesota Tour”, with performances from Atmosphere, Brother Ali, Get Cryphy, Carnage and Haphduzn. The tour begins Friday, March 1st in Bemidji, MN and makes stops in Duluth, St. Cloud, Mankato, and Minneapolis. Tickets are on sale now ONLINE! FREE DOWNLOAD: “It Ain’t The Prettiest”, a new song from Atmosphere featuring tourmates Brother Ali, Carnage, and Haphduzn. Listen/DL HERE!